New Delhi: On the eve of the World Pangolin Day on 20th February 2016, TRAFFIC India, a programme division of WWF-India and the country office of TRAFFIC, a global wildlife trade monitoring network, released a poster “Scaly future for the Indian Pangolin”, highlighting extreme impact of extensive poaching and illegal trade in pangolins and questioning the scope of its survival in India, while asking for support and action to save the species from extinction. Pangolins, often called scaly anteaters, are toothless and have large keratin scales covering their skin and are the only known mammal with this adaptation. Of the eight species found worldwide (four each in Asia and Africa), two are known from India- Indian Pangolin Manis crassicaudata and Chinese Pangolin Manis pentadactyla. In India, pangolins, are netted, trapped, shot or snared for local trade. They are also captured to meet the demand from international markets in Far East and Southeast Asia. Pangolin meat is considered a delicacy among several communities in India, as well as a “tonic food” because of its alleged medicinal properties. Their scales are also used for making local medicines based on traditional beliefs. Pangolins are also traded and smuggled live. Pangolin scales are used as an ingredient in traditional Asian medicines to help breast feeding women lactate, and cure ailments ranging from asthma and psoriasis to cancer, although there is a lack of scientific evidence suggesting that they are effective. Dr Shekhar Kumar Niraj, Head- TRAFFIC India says, “Reports in the past have indicated that the poaching and trade in pangolins is blatant mainly owing to little awareness about this mammal among the enforcement agencies as well as general public. It is evident that hundreds of pangolins from across India are caught every year from the wild and are smuggled through porous international borders to other countries”. “With virtually no information available on their population status, the current level of illegal utilization could have a severe detrimental impact on the future of the pangolins in the wild” Dr Niraj further adds. Hunting or trade in pangolins in India is a criminal offence and can lead to imprisonment for between three to seven years and a fine. Their international trade is also prohibited under the Convention on International Trade in Endangered Species of Wild Fauna and Flora (CITES). Despite the legal protection, reports have suggested that pangolin could be one of the most traded species from the wild. The poster has been jointly produced by TRAFFIC, WWF-India and the Wildlife Crime Control Bureau (WCCB) with the purpose of generating awareness about pangolins. 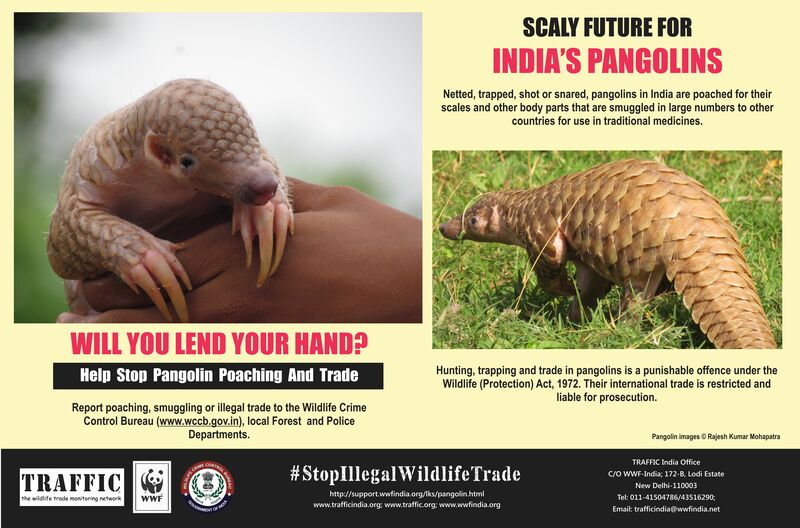 The poster is an extension of a digital media campaign that was launched and executed by TRAFFIC, WWF-India and WCCB in February 2015, highlighting the plight of lesser known but highly traded species in illegal wildlife trade including pangolins, mongoose and owls, among others. The digital campaign was successful in reaching out to nearly 1.4 million individuals on Facebook, Twitter and Google. TRAFFIC is hopeful that the poster “Scaly future for the Indian Pangolin” is well received and appeals for immediate action to stop poaching and illegal trade in this shy, lesser known nocturnal mammal, the pangolin. For any queries please contact Dr Shekhar Kumar Niraj, Head of TRAFFIC India at shekhar.niraj@traffic.org or call him at 09868178927 or you can contact Dilpreet B. Chhabra, Senior Manager-Communications, TRAFFIC India at dilpreet.chhabra@traffic.org or call her at 09899000472. TRAFFIC is a strategic alliance of WWF and IUCN. It was established in 1976 and since then it has developed a considerable international reputation for helping to identify and address conservation challenges linked to trade in wild animals and plants. In India, TRAFFIC carries out research and provides analysis, support and encouragement to efforts aimed at ensuring that wildlife trade is not a threat to conservation of nature in India. TRAFFIC in India operates as a programme division of WWF–India, the largest conservation organization in India.